Composed by Edward Elgar (1857-1934). Arranged by Paul Barker. 21st Century, Contemporary Classical, Big Band, Classroom, Pop. Score, Set of Parts. 37 pages. Published by Paul Barker (S0.420717). 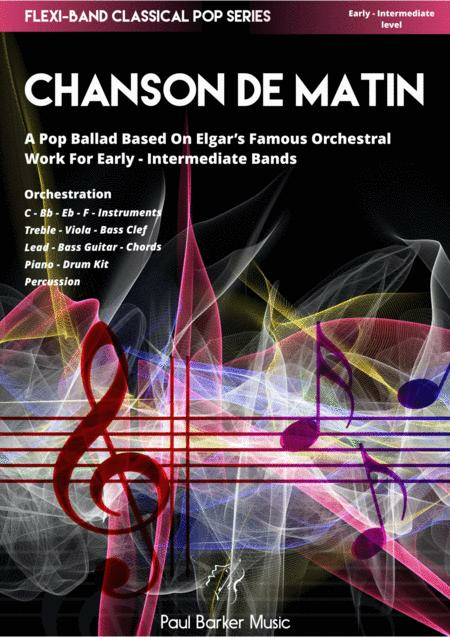 Elgar’s ‘Chanson De Matin' is another superbarrangement in a smooth pop-ballad style for Flexi-Band, Orchestras and Bandsof all sizes. Strong melodic lines using Elgar’s famous string themes togetherwith modern harmony supported by a robust rhythm section make this suitable forany combination of players. A fantastic way to introduce your band and audienceto one of the most famous pieces ever composed for Chamber Orchestra! Alsoideal for ensemble examination purposes. 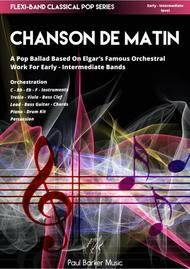 The Flexi-Band Classical Pop Series allows conductors tomix and match orchestration to meet available resources. Piano, Drum Kit,Rhythm Guitar and Bass Guitar provide strong harmonic and rhythmical supportfor common combinations of C, Bb, Eb, F, Treble/Viola/Bass Clef instrumentsincluding lead guitar and Nuvo instruments.